NetSuite’s chief executive Zach Nelson told The Reg his firm's products are finding their way into mid-market businesses by replacing Microsoft Dynamics GP, Redmond's accounting software. He said his team wins 75 per cent of the time against the competition in this arena, and the long-term goal is to bleed into the enterprise. Nelson calls it “two-tier ERP”: while Oracle or SAP are entrenched in big biz, NetSuite is working its way into networks of suppliers, customers and subsidiaries that are too small for Oracle or SAP. NetSuite’s average deal size used to be $5,000; Nelson reckons its average selling price has grown 20 per cent year on year, and it’s SAP rather than Oracle NetSuite encounters at the sales negotiation table. He said his traditional mid-sized customers “understand NetSuite and are prepared to pay more”. When large enterprises such as Qualcomm sign up, “that positively impacts selling price,” he added. Oracle and SAP noticed the emergence of their online rivals and, rather than running up the white flag, shifted their products towards the web albeit with mixed results. In the early 2000s, SAP slotted the SAP Web Application Server into its products so that office workers could use their browsers to access SAP software running on in-house servers. Then in 2007, SAP directly responded to Salesforce by launching Business ByDesign - a SAP-hosted ERP service delivered to web browsers from SAP's own data centre, and access to it was charged on a monthly and per-user basis. SAP had hoped for 10,000 customers and an easy $1bn in revenue from Business ByDesign by 2010. But in 2008 the IT giant put the brakes on the service when it realised it couldn’t scale the system’s architecture to cope with the increasing workload. “It’s not a fantasy," SAP co-CEO Jim Hagemann Snabe tried to reassure folks in 2010. A year later, the company downgraded its expectations to 1,000 customers on its cloud platform. Today, SAP claims revenue from its small range of "cloud" apps is growing. Meanwhile, in 2005, Oracle announced it would overhaul its products to turn them into services: Oracle said it would rewrite its code to use industry-standard protocols and programming interfaces to prepare the software for deployment on the web. 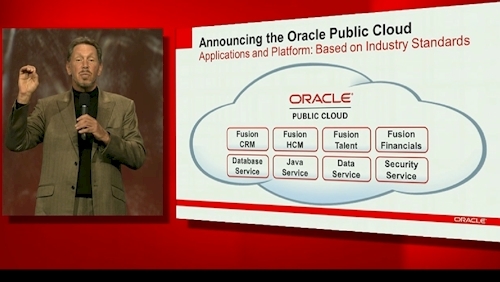 After six years of delays, Oracle made its new so-called Fusion applications available. But, according to Scavo, the database giant told analysts it has completed just 400 Fusion sales to date. “Oracle won’t say how many are live, and the word is most are for Fusion Human Capital Management and most are implemented in a hosted or cloud model - not because customers are clamouring for cloud solutions but because it’s so damn difficult to implement on-premises," he said. Oracle’s CEO Larry Ellison laughed off the cloud in 2008, asking “what the hell is cloud computing” before answering: "Hype." Five years later, Oracle says it's a “dumb idea” to suggest that the IT giant missed the bandwagon. Ellison claims cloud computing is “at the heart of everything we do” - and thus today's Oracle Cloud Platform runs the company's 12c database, Fusion software and Linux. In the run up to this turnaround, Oracle spent the past decade buying up a string of businesses, from PeopleSoft to BEA Systems, to gain new customers, products and technologies. The high point was Oracle's $8.5bn purchase of Sun Microsystems in 2010 for its server blueprints. Lately, though, Oracle has concentrated on swallowing cloud-based services, such as Nimbula to manage and deploy elastic infrastructure-as-a-service clouds offering Windows and Linux; DataRaker for analytics tools; RightNow for its cloud-based CRM; and Instantis for on-premises portfolio management. After all this, though – and we hear this at lot - the devouring of tech companies is a turn off for IT buyers, who don't want to be tied to a single all-encompassing supplier. Since its learning experience with the Business ByDesign cloud, SAP has plugged nippy in-memory database HANA into its products, and spent $4.3bn buying online technology marketplace Ariba. It also blew $3.4bn on management software biz SuccessFactors. In another step towards the cloud, in May 2012, SAP allowed customers to run its ERP Business Suite software, HANA database and other programs on the Amazon Web Services (AWS) cloud. Glen Robinson, an AWS solutions architect, told The Reg many SAP customers have migrated their existing ERP installations from in-house servers to AWS systems in the last 12 months. Those businesses have, we're told, saved money by no longer buying and managing their own hardware, and as a result of relying on Amazon's setup, have better failover and disaster recovery procedures. "Customers are under pressure to cut costs and maintain the same level of availability," Robinson said.